Home » Greenroom » Your Contribution to Green! What is Greenroom All About? Have you heard about the new launch in town? Corporate circles, office goes, business owners, workplace safety and health professionals are all abuzz about it. It is friendly, it is helpful, it breathes out useful articles every week which help businesses become healthier safer and greener workspaces for their employees. Well, we are sure you would have guessed by now. Yes, you are right. Everyone is talking about the relaunch of Greenroom, the blog by Alsco that is designed and constructed for the benefit of workplaces around Australia. Greenroom has well researched, interesting articles promoting basic values of health, safety and green, which in turn have a positive correlation with factors such as productivity and happiness levels, and contribute directly to the bottom line of your organisation. Greenroom and Workplace Greenery – Similar Benefits! Are you aware that the benefits of Greenroom are much like having live greenery and foliage in your workspace? Plants at your office help reduce stress, increase productivity, reduce sickness and absenteeism, improve air quality and absorb dust. These are just some of the objectives of Greenroom and its articles in order to help Australian corporates and office goers. Are you already thinking about increasing the number of potted plants in your office and the greenery around it? Just to help you along the way, here are some of the top reasons why you need to start doing that now. Plant at your workspace makes workers more productive. According to a study done by researchers at Cardiff, the introduction of plants at two large commercial offices in the UK and Holland improved productivity by 15 per cent within three months. The researchers concluded that a green working environment was more enjoyable for employees, more conducive to concentration and more productive for business than a Spartan one. Building and offices appear to be much nicer places when they have plants in them. Plants help people to relax. Studies have found that the presence of live plants reduces tension, anxiety, depression, and even anger amongst people. Apart from mental issues, plants are known to have physiological benefits too. They help reduce blood pressure, making people calmer and hence more focussed on their work. Plants are natural air filters. They absorb carbon dioxide from the air and breathe out oxygen during their process known as photosynthesis. Apart from this, they are known to absorb dust, bacteria and other harmful micro-organisms, thereby preventing them from being breathed in by human beings. Certain plants such as Citronella and Horsemint are known repel mosquitoes. Introducing plants in a workspace helps reduce sickness in more ways than one. Going green helps improve mental health, physiological health, air quality, drives away mosquitoes as well as improve humidity levels within air conditioned offices. With reduced illness and absenteeism due to plants, the company’s productivity, bottom line and top line are directly impacted in a positive manner. The presence of plants helps to absorb noise in the atmosphere, thereby helping employees to focus better on their work and thus be more productive. An office can have multiple sources of noise, people talking on the phone, chatter or a heated discussion in a neighbouring cubicle, printers, copiers, air-conditioning systems and the ringing of the ubiquitous mobile telephone. All these noises can be distracting and interruptive, reducing the output and causing people to make mistakes. Plants parts such as leaves, stems, branches are known to absorb sound. Thick, fleshy stems and leaves are particularly effective at absorbing sound and reducing noise levels. Unlike masonry walls, which reflect sound waves and scatter them throughout the room, plants absorb these waves and enhance the sense of calmness and tranquillity in the room. Plants cool by the process of “transpiration”, releasing moisture into the air. 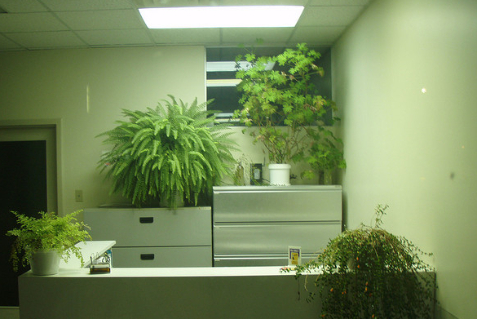 A USDA estimate is that proper use of plants could decrease air temperature in an office by as much as ten degrees. Additionally, the moisture released by indoor plants helps maintain humidity in the human comfort zone of 30 to 60 percent, and helps prevent materials such as wood from cracking when dried out. Need we say any more. So start your Going Green today. Going green with plants will help you and your workmates feel, live, work and breathe better, healthier. For more such useful tips on healthier, safer, greener workplaces, do visit the Greenroom regularly. It has carefully researched articles based upon what our readers and customers want. If these values are important to you too, then simply just subscribe to Greenroom. Maybe your already are doing some brilliant things at your workplace. Let us and our readers know about them. Greenroom regularly invites customers to contribute. Do you think you can help our other readers with your ideas? Do visit our Contribute to Greenroom Page to find out details about are customers who would be reading your article, some themes on which you could write and more. Share your ideas, tips and best practices with others in your industry and even across industries. Grow more plants to help your workmates and contribute to Greenroom to help over 45000 corporates around Australia.